So, the big Caged Sparrow debut date came and went, and I’m still staring at a not-quite finished project. I tried so hard to make the promised deadline, but life had other plans. Good plans, mind you…purposeful and fruitful disruptions, but disruptions nonetheless. As if we didn’t know. I loved working for Carrie for many reasons; she’s not only wise, but also funny, brilliant, calm in the face of (our) perceived calamity, and she can do some amazing things with chicken and a can of Cheez Whiz. Working with Carrie taught me to focus on the larger picture—what’s really important here? That may be why so many of her words of wisdom are echoing around my brain this week. Carrie is full of…wisdom. (Missed opportunity, Q&D Gang, I know.) My favorite Carrie-ism, although least relevant to this post is, “It’s not rocket surgery, you know.” Logically, I should have omitted that for the sake of flow here, but I couldn’t NOT share. So there you go. Carrie also taught me that one of the most important steps in a project is the final “quality control” check. I was so tempted to skip this step in Joe’s book, because I was THAT close to making the deadline, and I’d told so many people it would be ready. I didn’t want the book to be late. …and I realized I’m only shooting for June 15th because I set a June 15th deadline. Yes, I could actually hit the “go live” button right now if I really wanted to. All the parts are there. Joe has given his final thumbs up; Tony, the illustrator, has patiently tweaked the cover so often the words, “just one more time, I swear” no longer carry meaning (but it’s exactly the right cover now! ); and I’ve received excellent feedback from my beta readers, Mary, Becky, and Michele, who noticed a few missing words, some awkward phrasing, and one extremely improbable juxtaposition in the space-time continuum. Which brings me to another Carrie-ism. Having people find mistakes in my writing doesn’t bother me as much as it used to, particularly mistakes found before final print. I think of the beta readers as angels who, knowing what a klutz I am, walk ahead of me clearing tree branches and stones from path so I don’t fall on my face. At the office, on the rare occasion when a typo did slip through the cracks and make it to print, we could count on some arrogant know-it-all to toss a copy of the manuscript on her desk, offending typo circled thirty times in thick black marker. So, yes, I could have rushed through the last few steps and uploaded the final version, but as my hand hovered over that button, I thought of Carrie again. I remembered her more than once staring down a petulant customer, usually someone who thought an editor can zip through a 75-page passive-voice nightmare between the two-hour staff meeting and the mandatory pot luck luncheon and have enough time left over to design a cover for it. After all, editing is just reading, right? One day when I’m famous, I’ll tell the story of how I rewrote the first page of Caged Sparrow a gazillion times and it will be funny, somehow. So I’m not going to rush this. I’m going to finish these last changes unhurried, and then get one more proof copy so I can see for myself that the cover looks exactly the same in hand as it does on the screen, and THEN, I’ll hit the button. New arbitrary deadline: 27 June. …at which time I decided to quit my editing job. 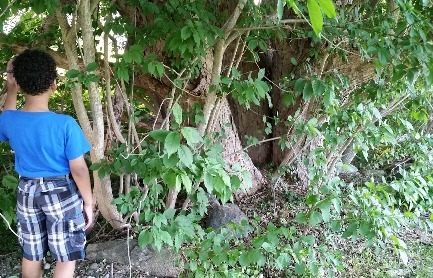 All that’s left of my childhood home is a tree. A modern, efficient-looking bank now occupies the land where once stood a beautiful gray Victorian-style home with a wrap-around porch. I lived there with two harried parents, seven rowdy siblings, two parakeets, a Saint Bernard named Barnacle, and a tiny black mutt named Dickens. This weekend I made the nine-hour drive from Virginia to Rhode Island to join a celebration for my oldest brother’s 60th birthday. We had a great time at the party Friday night, particularly because all but three of the nine siblings (we moved from the house above before the ninth was born) made it to the event. We sat around for hours, trading hilarious stories about pranks and escapades of years past, and reminiscing about the awful way everything turned out. Saturday I traveled through time to a place somewhere between A Tree Grows in Brooklyn and Mommy Dearest. In the morning I rode with my youngest brother, Erich, and his lovely family through Portsmouth (where we lived from the time I was 10 until I left home after high school) and then through the neighboring towns of Middletown and Newport, which had been my family’s big back yard during those years. We drove slowly, looking for the familiar haunts of our bicycle-enabled youth, noting gleefully that the Tasty Freeze on East Main is still there, and glumly that we’d never again buy candy at the Getty station at the top of our street because now it’s a pest control business. The roller skating rink where I spent many Friday nights…gone. Each landmark, whether it still stood or had been plowed under, evoked memories and prompted stories. Our former home on Braman’s lane in Portsmouth is still there, but it’s yellow and small-looking. Foreign. Not nearly large enough to have hosted all that happened there. None of Mom’s rose bushes or Dad’s fruit trees remain. The acres of farmland that once surrounded our house have been stripped and sub-divided. Unfamiliar houses are everywhere. A sense of melancholy crept into our day, and I noted that this was the last place our mom lived before she started to self-destruct…well, not all was her own doing. I’ll say only that much for now. 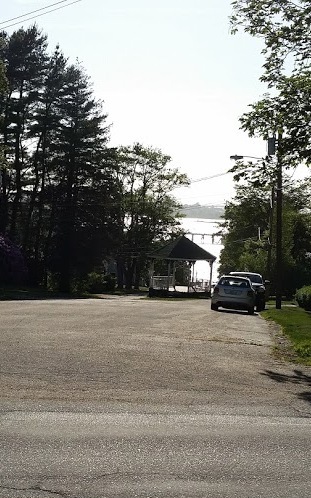 In the middle of the road, 200 feet from the library and overlooking the Narragansett River–what’s not to love? Then Saturday evening my oldest brother, Steven, took me to Tiverton, our childhood home in the 1960s. My beloved Essex Public Library has closed, but the huge gazebo in the center of the street below it still stands. I told Steve and his young son who accompanied us how I used to sit there on quiet summer mornings, pouring through my newly-checked-out storybooks and then head back up in the afternoon to return them for a new batch. Steve and I went to the old house, or to where it used to be. We stood in the bank parking lot, searching for something familiar. The small mom and pop grocery store next door is gone. Condos and other new housing are clustered all the way up the once-famous sledding hill. The huge wooden gate at the base of the hill, which we’d open at sledding times and where we posted guards to stop traffic so the sleds could cross the road…well, that’s gone too. That’s when I saw it: a tree in a stone wall. The memories came flooding back. This wall had marked our property line. There was the gap where we crossed daily on our way to Fort Barton Elementary School. Ten feet from the gap stood the large, gnarly (elm tree, I think) that had once served as my hiding place from the world around me. It was much bigger, of course, but I recognized it. As a young girl with too many brothers, I spent hours under that tree, whose limbs had touched the ground to offer perfect sanctuary. There I would read books, play with imaginary friends, and hide treasures among the holes formed by its extensive root system. As Steve chatted behind me about the Sylvia’s store, I choked back tears for what was never to be again. My melancholy mood continued as I drove back down Highway 95 toward home the next day, passing landmarks and exit signs that stirred up memories. Past RI Hospital, where my grandmother worked as director of Community Relations—an amazing position for a woman in the 1970s; the exit to Kingston, where my husband and I were married; the sign for Exeter, where my parents are buried; and Exit 3, where they found my dad—oh dear, now I’m getting ahead of myself. It occurred to me as I drove that God has given me the one thing that can revive the faded memories and keep alive those places and events that made us who we are today. He made me a writer. All this to say, I know what I have to do next. I have many short stories and writing projects in my head and on scraps of paper all over my office, but it’s time to put most of them on a shelf and focus on telling the story that shouts to be told: The story of nine children and the lost parents who raised them; the story of a woman who gave everything she had, only to learn it wasn’t enough; the story of a man with a perpetual objective to shame those who said he’d never make it, yet at every turn only managed to dig his own hole deeper. The story of us. My sister Jo has been encouraging me to tell this story for years, but I never felt it was the right time. Too much pain. Do we really need to open all those wounds? Yes, we should. I know that now. Some of us still have some healing to do. I hope taking this journey together helps us do that. Soon you’ll see a new tab on my website. A tab for “Mom’s Story.” There I will chronicle the making of what now has a working title, “Fading Rose.” To do this right, I’ll need to talk to each of my siblings, who now live in RI, Massachusetts, North Carolina, New Mexico, and Colorado, because it’s their story too. Get ready guys, I’m heading your way! Because our past gave us more than just a tree, and because you CAN go home again, as long as the memories stay alive. Christmas Year-round: I’m making the same suggestion for June and July, simply because it’s just that important. Please consider making a food drive and donating to your nearest food bank. Once they’re out of school, some area children will no longer receive that one guaranteed meal of the day, and yet, food bank supplies tend to diminish in the summer months. Sadly, many of us blessed with much think of making donations only during the Thanksgiving and Christmas seasons. Can you help? You’ll be glad you did.